Maimi’s fellow ℃-ute members shared some 2-shots with her in their updates, starting with this one Nakajima Saki posted in her update on the official ℃-ute blog the other day (1), and then this one Suzuki Airi posted in her update yesterday (2). Check out blog!project for full translations of the other ℃-ute and Hello! Project members’ blog updates. 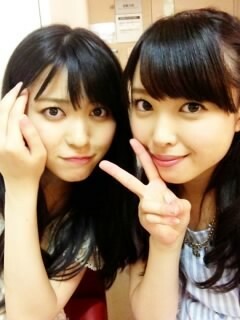 Posted on August 7, 2013, in Articles and tagged Nakajima Saki, Suzuki Airi, Yajima Maimi. Bookmark the permalink. Leave a comment.